Last weekend we were visiting family in Chicago and we always like to meet up with our Chicago dog pals while we're there. We also love traveling to Chicago because it's a great walking city and Rocco and I love our morning walks along the lakefront. 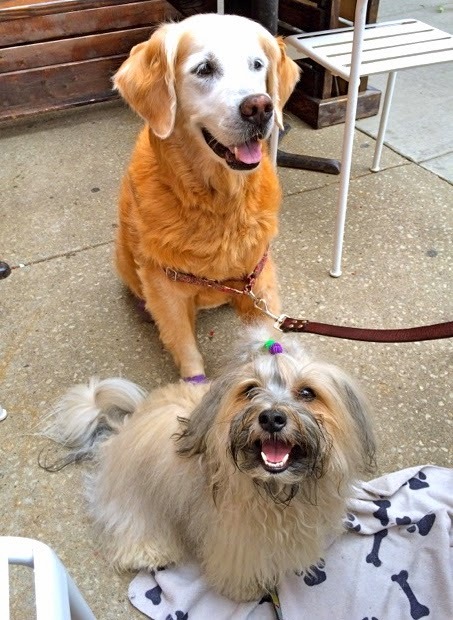 This time we took a different route to meet up with our pals Sugar the Golden Retriever and Dolly the Doxie. 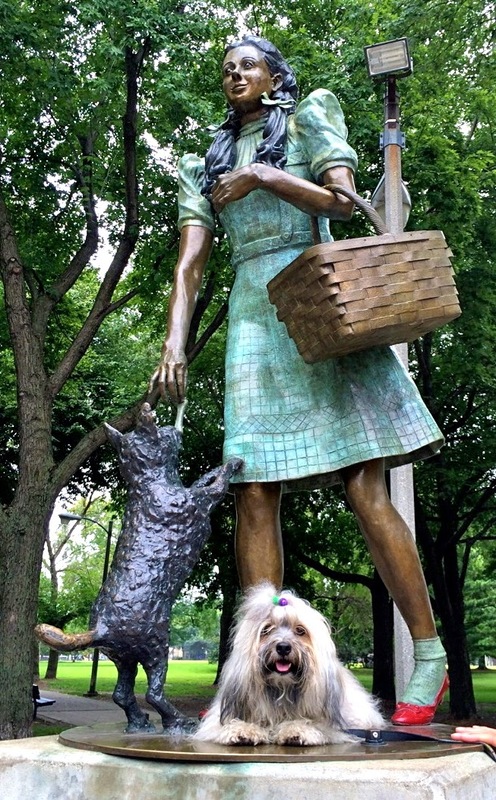 We planned to meet up at Oz Park, a lovely little city park with a Wizard of Oz theme. Even though the park is fairly close to Lincoln Park, my usual place to walk in Chicago, I had never been there. And, since it was the weekend of the annual Chicago Air and Water Show (with loads of people and traffic), we knew we'd have to walk there, because driving from my mom's location is out of the question. It's only a 1.5 mile walk to Oz Park, but still long enough to work up an appetite! We enjoyed watching the air show along the way and cutting through a few neighborhoods we don't typically walk though. We also had the added incentive of meeting up for brunch after our Oz Park walk! Rocco's close-up with Toto and the ruby slippers! 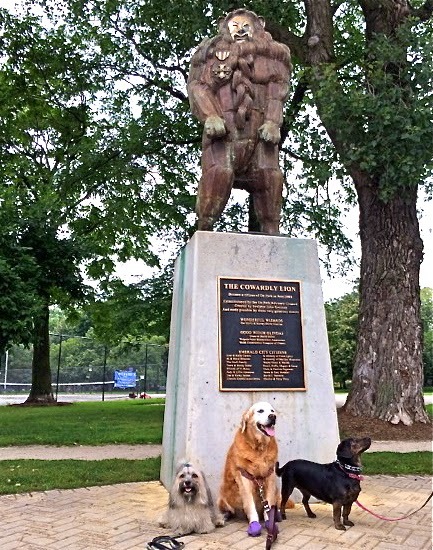 Next, the pups posed with the Cowardly Lion! We took a nice walk around the park and then headed to Chez Moi for brunch. Yum! Sugar visited with Rocco on our side of the table and Dolly was on the other side. We had a great brunch and visit! Rocco wore a purple hair band in honor of Sugar's purple shoes. Heehee! We love finding new places to walk AND meet up with pals along the way. It's the best combination! Have you found a new place to walk recently? What a great place and loved the statues. We think the touch of the purple ribbon in honour of Sugar was very sweet. Have a fabulous Friday. It's a fun park! Happy Friday and weekend to you! Looks like a really fun time. We had a great time! Popping over to your place to say hi next! 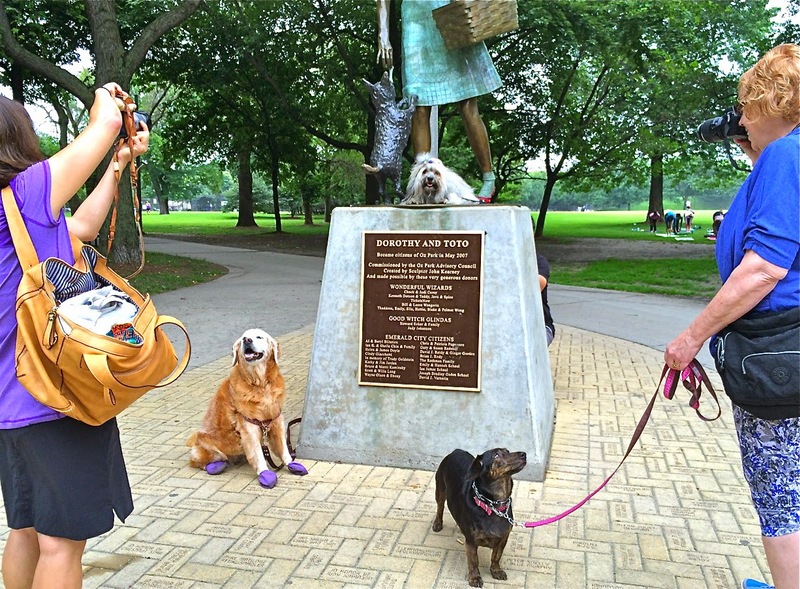 Well how cool is that that you got to meet up with Sugar and Dolly and get to visit a neat park as well ! Very cool! 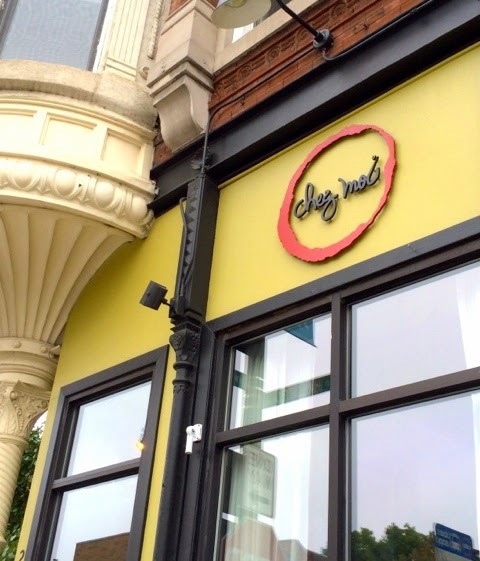 We love meeting up with them when we visit Chicago. 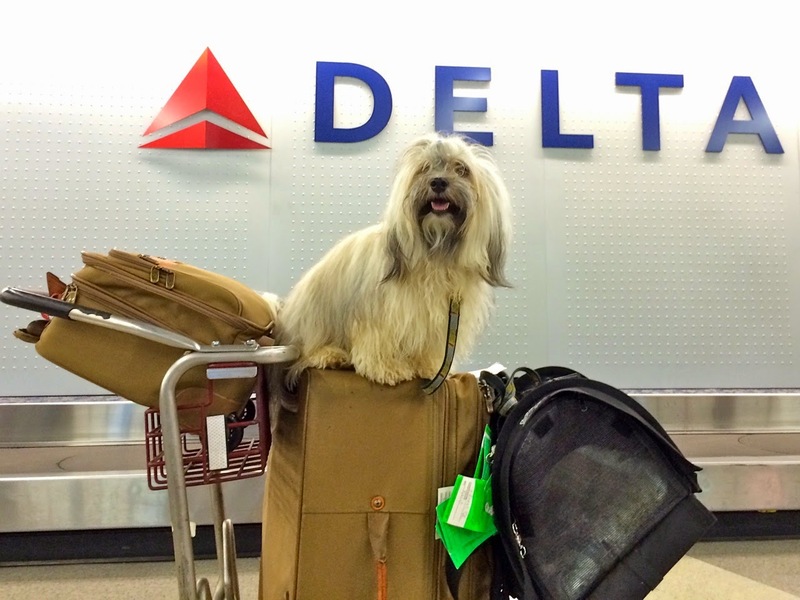 What a great place to visit and doing it with blogging furiends make it that much more fun! Thanks for sharing! We had a blast! An Atlanta bloggie meet up is next! Exactly! Blogging can be so solitary, it's so nice to meet up with our blog pals and get to chat in person. Chicago sounds like such a great place to be a dog! Maybe one day we can take a road trip down there and check it out. Love Rocco on the luggage cart! We love visiting Chicago. We've found plenty of dog friendly restaurants there too and we LOVE the lake! Look at that face! Looks like you enjoyed. Looks like fun!! I wish we could have joined your pup walk! It's always a good time to meet up with our pals, and we love meeting new pals too! Darn, I wish I had been in town, but I was in Dallas with my daughter this past weekend. I love watching the jets fly over our house, since we're between Chicago and Gary, where they do a lot of the staging. 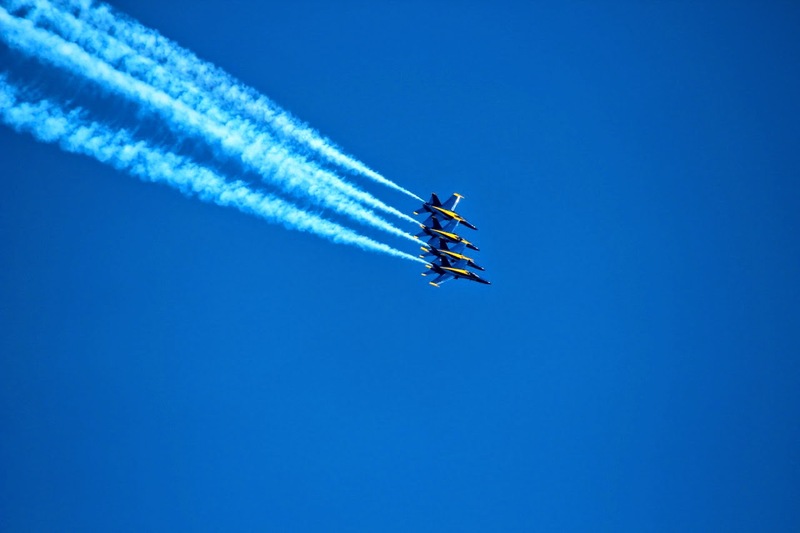 I can't remember a year that the Blue Angels haven't flown over our house. I'm in that part of Indiana that should actually be Illinois. We're just five miles from the IN/IL border and only about 20 miles from the SE edge of Chicago (at least as the crow flies). If sounds like fun. I wasn't aware of the Oz themed park, so I'll definitely have to check it out. We do have a yearly Oz festival in Chesterton (a short way east of us) and my girls always enjoyed going to that. There's the Popcorn festival in Valparaiso, too, which used to have Orvil Redenbacher as the grand marshal for many years, since that's where his popcorn company started. Oh wow! I didn't realize you were that close to Chicago. I'm there every year for the air show since it's almost always on my mom's birthday weekend. I bet the popcorn festival is a great time too! I love the movie too! The yearly airing of the movie was a bit deal when I was a kid! Yes! It's so much fun to meet our bloggie pals in person! What a fun time, and a cool place, it must be great to hang out with blog friends. I love how Rocco wore a purple ribbon for Sugar! What a fun time! How awesome that you got to meet up with blog furiends! I'm so jealous! The pics were so fun to look at! Love those statues! And Rocco's hair band. How great that you all met up in the Windy City!